Yes, I think the election season is a disastrously overlong distraction. If people’s interest in it can be used to get them to ask their heroes to lead on important matters — such as asking Bernie Sanders to rally the Senate for the Iran agreement or against the TPP — then that’s a nice silver lining. If people want to get drunk watching Republicans debate rather than some other poorly conceived tragicomedy on TV, what do I care? But there’s usually little of moving the beloved leader forward on anything, because supporters take on the role of servants, not masters. Criticism equals endorsement of some other leader. Advice equals endorsement of some other leader. And facts are seen through glasses tinted the shade of one’s preferred public commander. 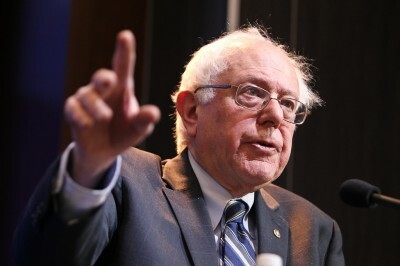 RootsAction’s petition asking Sanders to talk about the military has nearly 14,000 signatures. It’s produced a number of claims that Bernie in fact does talk about the military, and has a great record on it, etc. Following up on each of these claims thus far has led to virtually nothing new. If you go to Bernie’s website and click on ISSUES and search for foreign policy or war or peace or overall budget priorities (militarism now actually gets 54% now), you’ll be searching forever — unless he adds something. His “issues” page acts as if 199 nations and 54% of the budget just don’t exist. The military wastes money and its contractors routinely engage in fraud. The Department of Defense should be audited. Some weapons that I won’t name should be eliminated. Some cuts that I won’t even vaguely estimate should be made. All the wars in the Middle East should continue, but Saudi Arabia should lead the way with the U.S. assisting, because Saudi Arabia has plenty of weapons — and if Saudi Arabia has murdered lots of its own citizens and countless little babies in Yemen and has the goal of overthrowing a number of governments and slaughtering people of the wrong sect and dominating the area for the ideology of its fanatical dictatorial regime, who cares, better that than the U.S. funding all the wars, and the idea of actually ending any wars should be effectively brushed aside by changing the subject to how unfair it is for Saudi Arabia not to carry more of the militarized man’s burden. Oh, and veterans, U.S. veterans, are owed the deepest gratitude imaginable for the generous and beneficial service they have performed by killing so many people in the wars I’ve voted against and the ones I’ve voted for alike. A brilliant and talented friend of mine named Jonathan Tasini is about to publish a book on Sanders’ platform on numerous issues. I asked to read an early copy because I had a huge hope that perhaps Sanders had addressed what he’s silent on in an interview with Tasini. He’s silent on how much he’d cut the military, even within a range of $100 billion. He’s silent on alternatives to war. He’s usually silent on U.S. subservience to Israel. He’s silent on drone murders. He’s silent on militarism and military spending driving the wars, the civil liberties losses, the militarization of local police, the militarization of the borders, the nasty attitudes toward immigrants and minorities, etc. He’s silent on the public support for two, not one, great sources of revenue: taxing the rich (which he’s all over) and cutting the military (which he avoids). I admit that I also had a secret fear that Tasini’s book would not mention foreign policy at all. Well, the book turns out not to include new interviews but just to collect past speeches and remarks and interviews and legislative records, carefully selected to paint the most progressive picture. So, wars Sanders opposed are mentioned. Wars he supported are not. Critiques of wasteful spending are included. Support for wasteful spending when it’s in Vermont is not. Etc. I do recommend getting the book as soon as it comes out. No similar book could be produced about any other candidate in the two mega parties. But take it all with a grain of salt. You’ll still have no grasp of Sander’s basic budgetary platform or approach to diplomacy or foreign aid or international law or demilitarization or transition to peaceful industries — assuming he develops any approach to some of those things. And to those who are already telling me that Sanders has to censor his actually wonderful secret desires to move the world from war to peace (and presumably a 12-dimensional chess move by which Saudi Arabia check mates all the warmongers and fossil fuel consumers) — that he has to keep quiet or he’ll have powerful forces against him or he’ll be assassinated or he’ll lose the election — I’m going to say what I said when people told me this about Obama: IT’S NEVER WORKED THAT WAY IN THE HISTORY OF THE WORLD! WHAT ARE YOU SMOKING? We’re lucky if candidates keep half the promises they make. Getting them to keep promises they never made but we fantasized has never been done. I also had hopes for the wonderful and admirable Nicole Sandler’s radio show on Thursday. She’d said that Sanders had no reluctance at all to discuss militarism. But of course I didn’t expect him to refuse to talk. I expected him to just muddle through the same old same old. And so he did. He talked about cost overruns and waste, fraud, a DoD audit. He said he’d eliminate some weapons (but didn’t name a single one). He said he’d make cuts but “I can’t tell you exactly how many.” Can you tell us roughly how many? He said he wanted “Muslim countries” to help with fighting the wars. Sandler prompted him with his Saudi Arabia thing, and he went off on that, and the host agreed with him. So the Socialist wants to turn foreign affairs over to a royal theocratic dictatorship, won’t say what he’d do to the largest item in the budget even though it’s WAR, and he’s bravely come out against fraud and waste without naming any instances of it. And now I have a choice of being satisfied or an ungrateful perfectionist secretly supporting Hillary, even though her record on militarism is worse than that of almost any human alive and her website lists Iran, ISIS, Russia, and China as enemies to be stood up strong against. Oh, forget it. What time do the Republicans come on? Pass the whiskey.